Short of ascending in a hot air balloon or shimmying to the top of Big Ben, probably the best way to gaze out over the capital of England is from one of the 32 capsules of the the world’s largest cantilevered observation wheel. The rugby-ball shaped cabins offer an unrivalled vantage point for taking snapshots of the city’s landmarks – but there’s nothing like a few greasy finger marks or a distracting dollop of bird’s dropping on the windows to spoil the results, is there? With this in mind, its easy to see why the glass at this enormous 130 metre tall rotating structure has to be kept nothing less than spotless. But it’s not quite so easy to imagine how those challenged with such a task would go about it. First of all, there’s the problem – at such a large and unusual structure – of reaching all the glass safely and effectively. Then there’s the added complication of any water used needing to be disposed into the River Thames bringing all kinds of environmental regulations. Before we could win the contract at the London Eye we first had to prove that the water was not going to be an effluent as such. (The system uses deionised water which does not contain chemicals and is therefore safe to the environment). 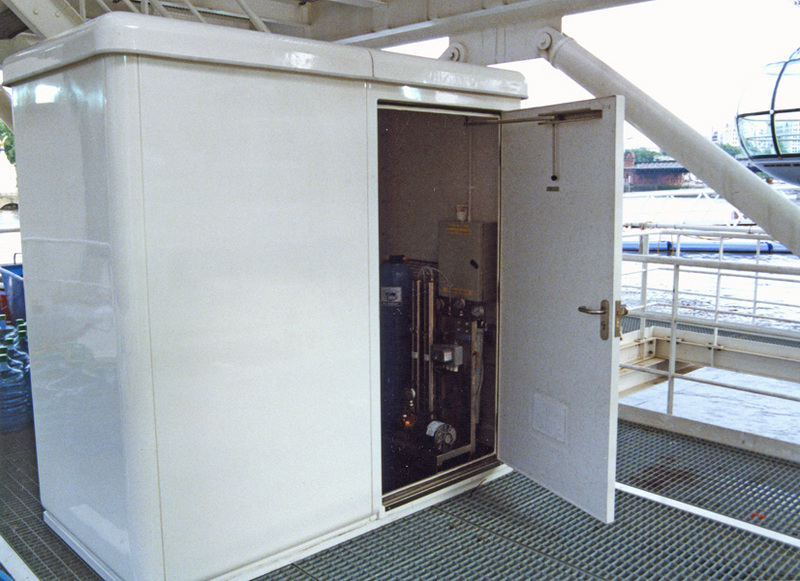 We then set up an independent housing unit – basically a large box which looks a bit like a shed – on one of the levels of the wheel. Into that we ran all of the supplies, electrics and everything needed for the water treatment. 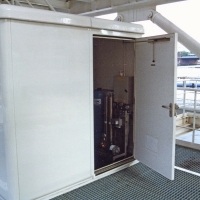 The “shed” holds a 1000 litre water tank and reverse osmosis system capable of producing 94 – 98% pure water. It was also formerly used as the platform from which the poles could be used. 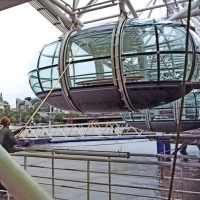 However, a year on from the wheel’s opening, in 2000, it was decided to create access to the poles on both sides of the structure by putting in a pipe to run from the housing across to the other side of the wheel so the poles can be independently plugged in at the points where the operatives need to use them. This project, undertaken by Aquafactors, involved installing heated pipe-work to prevent the water in the pipes freezing – allowing the poles to be used regardless of the weather conditions. The housing itself also has its own heating system to stop the water in the tanks turning into ice. Above it is a platform which the pole operatives stand upon while the wheel is rotated for them to work on one capsule at a time. The shape of the capsules presents a particular challenge, says Dan. It isn’t like cleaning a flat surface. This is helped by double trim brushes which have slightly longer bristles on the outside than on the inside. These splay outwards and help remove dirt. As well as having an overhead rinse spray, the poles allow water to be passed through the brush heads. While this would enable detergents to be fed to the brush head, no chemicals are used at the London Eye. Only pure water is used here. 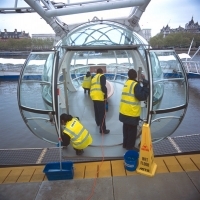 It is slightly aggressive, which is very helpful at removing dirt build up – although there is no build up at the London Eye as it is cleaned so regularly. The surfaces here are cleaned more regularly than any surfaces that we know. 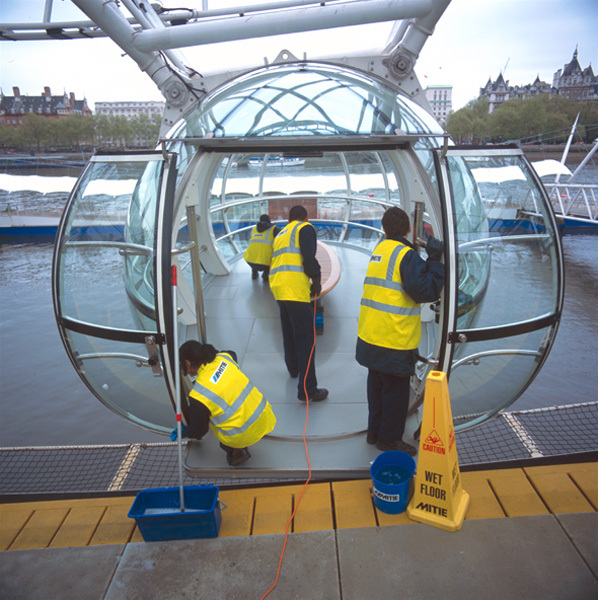 The inside surface of the glass at the London Eye is tended to seven days a week, according to Martin Giennon who oversees the work an behalf of cleaning contractor Mitie, which, like Aquafactors, has been involved at the London Eye since its beginning. 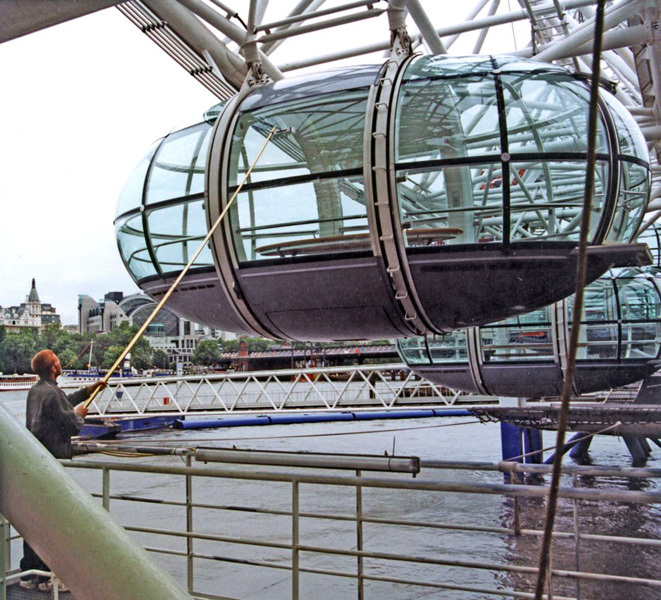 Because the wheel takes in passengers from 9.30 a.m. up to 10 p.m. the problem faced by operatives is fitting in the cleaning task out of these hours – while still needing to work by daylight. 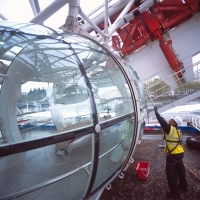 This is overcome by tackling the interior side of the glass – from inside the capsules – between 5.00 and 7.00 a.m. while leaving the exterior surface to be cleaned with the water fed poles from 7.00 to 9.00 a.m., twice a week. We have a team that does the internal cleaning every day with microfibre cloths that prevent smearing. The exteriors are done with two people at a time using the water fed poles – one positioned on the north side of the wheel and the other at the south side. The pole system we use is beneficial as it has good productivity and it means you don’t have to use access equipment. Also the glass doesn’t need to be cleaned off after using the poles because the deionised water doesn’t leave any smears. It sounds as if the future of unblemished views could be safe here for a while.